The cold may also affect some pasture in an area that’s had its share of forage-killing drought. The livestock situation was a little brighter in Boone County. “The frequent showers we have been experiencing are a blessing in cattle country,” said Mike McClintock, Boone County agent. The storm system that moved through Arkansas Thursday and into Friday morning, downed trees in numerous counties and damaged homes in Pike County. It also brought hail up to 3 inches in diameter and plenty of rain. While delays are inevitable with more rain on the way, no one is in panic mode yet. 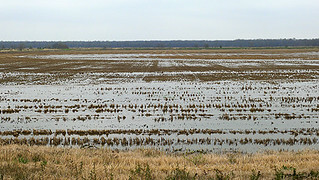 “We received 1.5 inches of rain earlier this morning,” said Scott Stiles, extension economist based in Jonesboro. “There's another good chance of rain on Sunday – 70 percent -- and again on Tuesday. In Prairie County, some of the spring planted crops are starting to peek through the soil. For more information about crop production, visit our newly revamped site at www.uaex.edu and http://Arkansascrops.com.